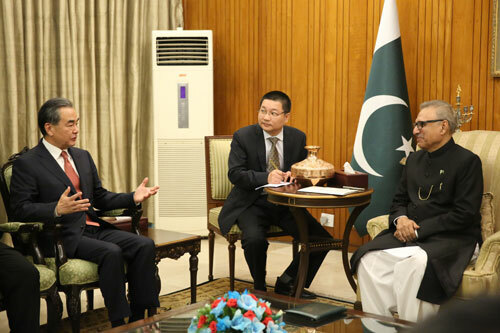 On September 9, 2018 local time, President Arif Alvi of Pakistan, who had just took office on the afternoon of the same day, met with State Councilor and Foreign Minister Wang Yi in Islamabad. Arif Alvi asked Wang Yi to convey his warm greetings to President Xi Jinping, and he was glad to meet with Wang Yi, the first foreign guest, after being sworn in as President. He also thanked Wang Yi for accepting the invitation of the Pakistani side to attend his inauguration ceremony. Arif Alvi expressed that friendship with China is an established national policy of the Pakistani side. Over the past more than five decades, the Pakistani side has always cherished its friendship with China. Bilateral friendship is not only based on mutual benefit but is deeply rooted in the hearts of the two peoples. The Belt and Road Initiative proposed by President Xi Jinping is visionary. The China-Pakistan Economic Corridor (CPEC), as an important part of the joint construction of the Belt and Road Initiative, has brought and will continue to bring tangible benefits to the Pakistani people. The new Pakistani government is committed to fully deepening the construction of the CPEC, and is willing to learn from the Chinese side in such areas as poverty alleviation, anti-corruption and job creation. Wang Yi conveyed President Xi Jinping’s congratulations and greetings to Arif Alvi. Wang Yi noted that he was honored to accept the temporary arrangement of the Pakistani side to attend the inauguration ceremony of Mr. President and become the first foreign guest Mr. President met, which fully demonstrated the high level of China-Pakistan friendship. Today, the history of Pakistan has turned a new page. It is believed that it will explore a brighter future for the goal of building a new Pakistan. China-Pakistan relations stand as firm rock, and will remain unchanged despite the changing domestic situation. The unbreakable China-Pakistan friendship has withstood the test of international vicissitudes. My visit, which is under President Xi Jinping’s guidance, aims at aligning with the new Pakistani government so as to continue and reinforce the sound momentum of bilateral cooperation in all fields. Wang Yi introduced at inquiry the experience of the Communist Party of China and the Chinese government in poverty alleviation and reduction as well as anti-corruption and the upholding of integrity. He reiterated that the Chinese side is willing to, together with the Pakistani side, constantly enrich and expand the construction of the CPEC, intensify coordination and cooperation in international and regional affairs, and safeguard the core interests of the two countries, and maintain international fairness and justice. Invited by Foreign Minister Makhdoom Shah Mahmood Qureshi of Pakistan, Wang Yi paid an official visit to Pakistan from September 8 to 9. 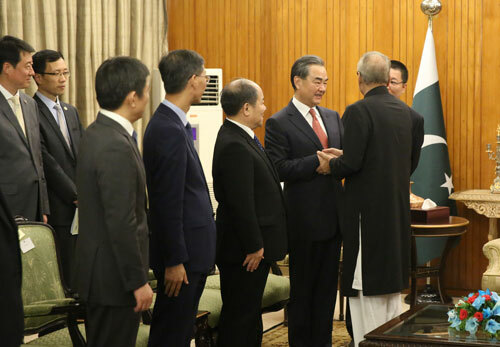 During his visit, Wang Yi also met with Prime Minister Imran Khan of Pakistan, held talks and jointly met the press with Foreign Minister Makhdoom Shah Mahmood Qureshi, and met with Chief of Army Staff Qamar Javed Bajwa and Speaker of the National Assembly Asad Qaiser of Pakistan.